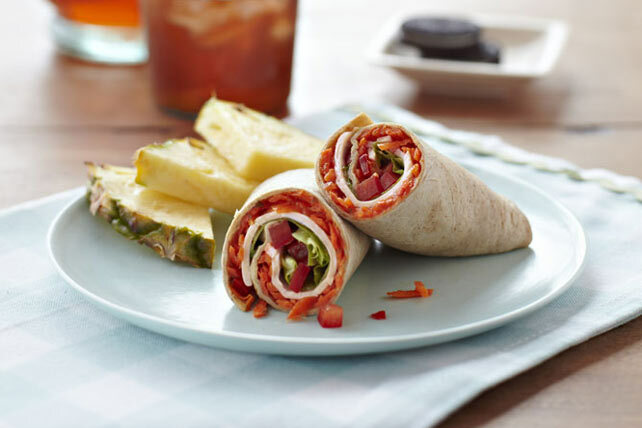 What do you get when you roll shredded carrots, zesty dressing, cheddar cheese, crisp lettuce, red peppers, and chopped tomatoes inside whole wheat tortillas? Our Cheddar-Vegetable Tortilla sandwiches - a whole new way to enjoy lunch on-the-go. Sandwiches can be made ahead of time. Wrap tightly in plastic wrap. Refrigerate up to 24 hours before serving.